This historic opera house, which doubles as city hall, is the pride of downtown Sumter. Built between 1893 and 1895, it is the second opera house to stand on this site. The first was lost to fire in 1892. In 1936 the opera house was converted into a movie theater and operated as such until 1982. That year, the movie theater closed, and the building sat vacant until the City of Sumter purchased it in 1984. The city then completed renovations of the historic building in 1987 to once again use as a city hall as well as an opera house. Well over a century after it was built, the Romanesque opera house still plays an integral role in Sumter. While municipal offices continue to occupy much of the building – including city council’s chambers – a first-floor auditorium fills the hall with the sounds of live performances. Today musicals, plays, and concerts are well-attended at the Sumter Opera House, many of which are free to the public. Below is an historical image of the opera house and city hall in 1907. A few years earlier in 1888 Belva Ann Lockwood delivered two lectures from the original opera house. Lockwood, an attorney, was the first woman admitted to the United States Supreme Court bar in 1876. She argued her first case before the Supreme Court the following year. In 1884 she became the first woman to launch a presidential campaign. She ran again in 1888, the same year she visited Sumter. Originally called Sumterville, the town was the county seat of Sumter District and later Sumter County. A settlement by 1785, Sumterville was named after General Thomas Sumter, South Carolina Revolutionary war hero. In 1798, the village was selected for the site of the courthouse of old Sumter District. With no access to waterway or railroad, development was slow until the Camden branch of the South Carolina Railroad extended into the town in 1843. 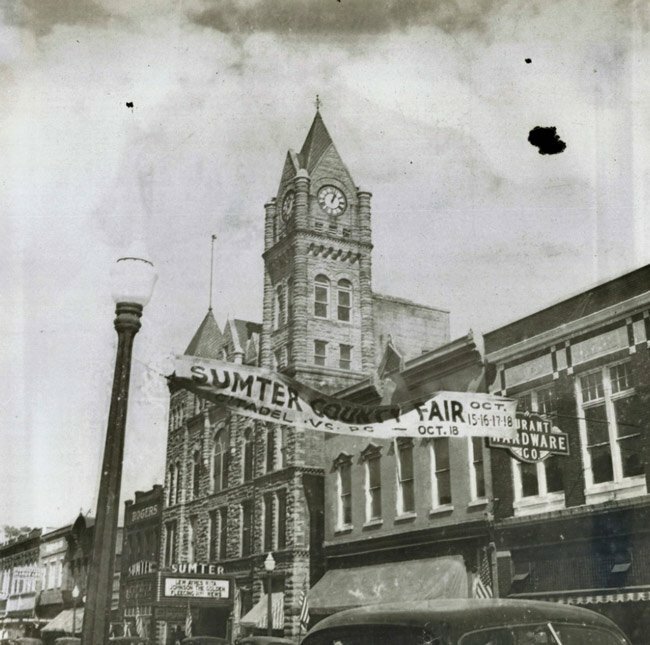 Incorporated in 1845, Sumterville’s name was eventually changed to Sumter. 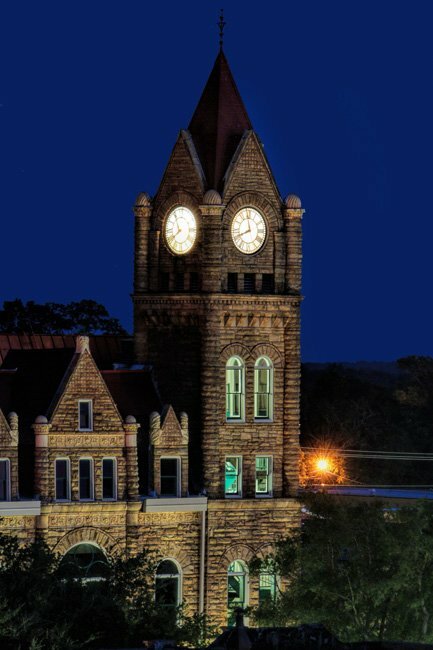 The town was officially chartered in 1871. 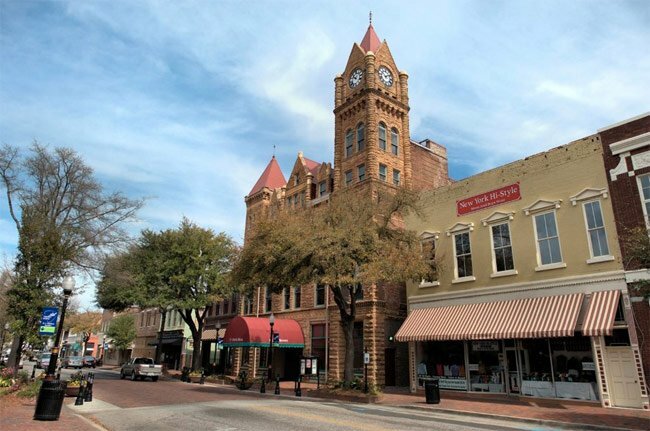 Sumter’s political, commercial, and cultural development is reflected in the architecture of the central business district that spans a time period from 1828 to the present. 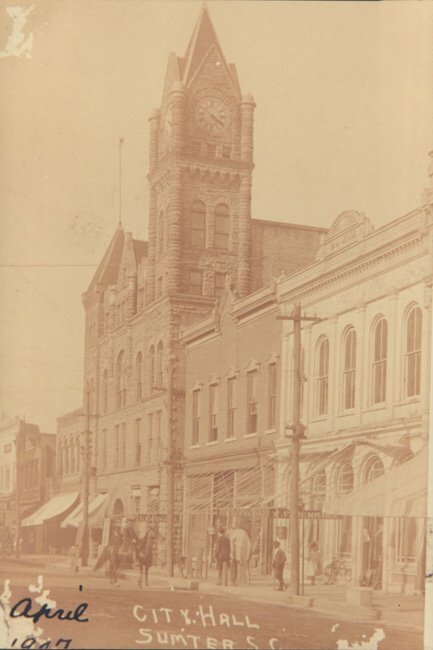 Many of the buildings in the original commercial district date from 1880 to 1912 and are typical of turn-of-the-century commercial buildings, using materials such as pressed tin, limestone, and brick. Detail work of buildings includes arches, columns, decorative brickwork and dentil work. Contributor Larry Gleason, who took the photo at the top of the page, notes that it was an especially difficult shot. He explains: “It is not an easy building to photograph because of height on a narrow street.” We love how this picture captures not only the Opera House, but also the surrounding stores and street, creating a special glimpse of life in downtown Sumter! I worked at the Opera House when it was the Sumter Theatre. I worked at the concessions stand. Also, I had to put the letters on the Marquee for the title of the current movie. It was in the early 70’s while I was going to high school. I have been all around on the inside of the building, the balcony, the projector room, etc. I use to exit the theatre, left side, going through the police station, at that time. The other side exited out into the alley. In the back, behind the screen, there was a tall ladder on the wall going to the balcony, or pigeon loft as I knew it, that I climbed to get a good view of Sumter. It was a theatre for a long time. I remember going to see movies in the 60s — 2001: A Space Odyssey, Butch Cassidy and the Sundance Kid, The Good, The Bad and the Ugly, James Bond movies, and a lot more of the cowboy westerns. I have not been back to the Opera House since I graduated high school. I’ll have to make a trip soon. It should be interesting. I have never been to the opera house, but I am going to make it a point to visit the house and show.